First off today, I've got a bit of a confession to make. If we're being honest, before we decided to start up Genresquad, I was a little reluctant to get back into writing. Other than my Letterboxd account, I hadn't written for an outlet since the beginning of 2012, and I was extremely out of practice. I mean, I wasn't even sure that I COULD write well about films and TV anymore. Worse even, in the time that I hadn't been writing a lot of my viewing habits had changed. I was completely obsessed with blockbuster movies (especially superhero films) and simply wasn't making enough time for the types of pictures that had made me who I was as a viewer and a movie writer to begin with. Don't get me wrong, I was still watching A LOT of action films, but I was also ignoring a lot of movies I would have simply eaten up before, and this goes especially for a lot of international cinema. Well, thanks to getting back into writing (as well as the summer movie season failing to consistently keep my interest) I feel like I've been getting back to my roots a bit. With every column or list I've written, if it wasn't about a new movie I just watched, I've decided to revisit as many favorites as I've been able to, as well as catch up with a bunch of flicks that I've missed. After falling back in love with my all-time top 10 and doing a deep dive into my favorite ninja movies, I'm starting to really feel like my old self. Since then, I've been feeding on a steady diet of martial arts, war movies, crime pictures and action flicks of all sorts. Even with my summer TV watching, a time when most of my favorite series are on hiatus, I've been trying to catch up on some shows I've missed up until now and taking some chances I normally wouldn't on series, especially Netflix's Marco Polo. Now, while I realize that the series has been severely derided by most critics and viewers (and with good reason), for me personally, the show just hits me in my sweet spot between my loves for stuff like as Game of Thrones, Spartacus: Blood and Sand, and Shogun (ask your parents). It's certainly not anywhere close to the best show on TV, but myself being half-Korean, I can't argue against a show that features a cast of 90% Asians, and on top of that has a ton of fighting, huge battles, as well as fascinating palace intrigue. It's a great looking show with blind kung-fu masters and fun military match-ups (Mongols vs Knights! ), so I don't mind letting its faults go and instead just enjoy the ride. So first off, I will say that while Kazakhstan is technically in Central Asia, it's films do not tend to be categorized as "Asian" very often, but for the purposes of this column and the movie's subject matter, I'm going to count it. Now as you may have guessed, Mongol is merely the origin story for Genghis Khan, chronicling the man's life from childhood to finally taking power over the Mongol plains. Originally named Temüjin, the film begins with the future Khan of Khans imprisoned as a slave, pondering his past as the child of a betrayed local chieftain, to his various battles for revenge and for love, his life spent in constant war, exile or imprisonment. Though the film's action is fierce, and the arc of this character is in the grand tradition of epic film heroes, one of things I really love most about this movie is simply its sense of place. Director Sergei Bodrov makes this picture a very intimate look at the plains of ancient Mongolia and its indigenous people. I've actually never experienced a film that featured Asian cultures that looked and felt quite like this one does, as the nomad tribes shown here in this film feel closer to Native Americans or Inuits than they do to the Chinese or other Asian cultures I've seen before onscreen. As for Genghis himself, Tadanobu Asano plays Temüjin with a quiet charisma, making this largest of larger-than-life characters understated and human. There's a warmth to this portrayal which makes it easy to understand why men would follow him into battle, but it also shows why that same warmth would make him an easy target for other Khans who would prefer to rule their own territories with an iron fist. So often seen as a conqueror and tyrant, it's interesting to see Genghis portrayed as a straightforward hero. If Bodrov's proposed trilogy comes to fruition, I'd love to see how the character changes over time. Where the film does feel more familiar is in its huge battles, which are raw and bloody as combatants clash sword and shield together. Bodrov instills an innate sense of danger, with even Temüjin feeling like he could be killed at any moment though he be the title character and the one recalling flashbacks. This all builds to a tremendous battle of thousands of spears, swords, and thundering horses, while a literal thunderstorm provides the ultimate background. Mongol doesn't break the mold of medieval war pictures, but it's a grand example of one. With gorgeous photography, relatable characters and tons of action, this is a movie worthy of telling the story of one of the most mythic figures ever known. While there are more polished epics of this nature out there, this one is definitely worth your time. From the beginning of the Mongol Empire to the final days of it. Musa: The Warrior tells the tale of a Korean delegation who is trying to return home after being captured by Ming Dynasty soldiers and then exiled to the deserts of Northern China. On their journey, they find a contingent of Mongols who have captured a Ming Princess (Zhang Ziyi) and decide to free her in order to gain favor with the Chinese court so they can return home heroes. Now to put this film into context, this was the largest South Korean production ever filmed at the time of its release in 2001. While the studios of Japan, China, and Hong Kong had been making films for a century, Koreans had yet to really break out on the international scene and it's tough to find anything pre-2000 that's really of note. South Korea is now one of the powerhouses of Asian cinema, and Musa is one of the stepping stones that helped them get there. As for the film itself, watching it does show what Korean cinema has to offer when it comes to this type of movie; the film is much grittier and grounded than what Hong Kong was offering at the time, while still being able to stand shoulder to shoulder with its contemporaries in terms of spectacle. Fans of epics such as Saving Private Ryan and Gladiator may appreciate the frenetic action offered in this film, with Woo-sung Jung as the picture's standout performance as Yeo-sol, a former slave willing to do anything to save the life of the Princess. Wielding a giant spear, Yeo-sol beheads and impales Mongols by the dozen while his comrades desperately fight for their lives. The final set piece of the film is the siege of an abandoned fortress, and the sequence, featuring our small band of heroes, a handful of villagers, and an army of Mongolian warriors on horseback, is something straight out of a Kurosawa or Peckinpah picture. 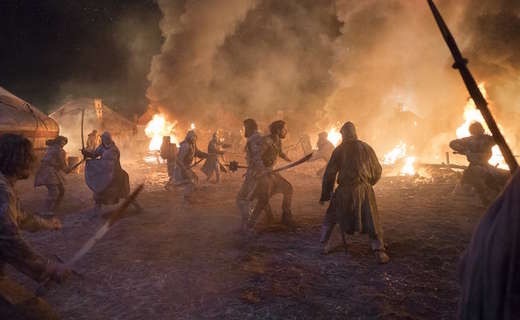 Director Kim Sung-su orchestrates vicious, yet gorgeous chaos as the walls of the fort closes in on these characters; the attacking Mongols pulling out all the stops in order to get the Princess back in their hands. In the end, neither side gets away without being terribly devastated. At the time of its release, Musa was a huge movie for me. I loved epics like Braveheart and Gladiator but there weren't a plethora of them at the time, and this film showed me that more countries were finally starting to take on these types of projects and make them in their own voice. Watching it now, Musa still holds up in so many ways, but nothing could match how that initial impact excited me about the epic battle movies yet to come and what Korean cinema in general had in store for me. While I feel like films such as Mongol and Musa (as well as any number of samurai or wuxia pictures for that matter) contain stories that are pretty universal and identifiable to Western audiences, Chen Kaige's masterpiece about the first Emperor of China is like entering an alien world. This is a film with a ridiculous amount of pageantry and court politics, and simply the way people carry themselves seems odd at first and may be offputting to some audiences. It also contains locations so sumptuous that they seem to reach the point of almost bursting with magnificence. Again though, it's the people within the Imperial cities that really feel alien to you, as the way they speak (and I'm not talking about Mandarin), walk, and carry themselves simply seems to foreign, as if they were in a theatrical production 24x7. One example of such a character is a man whose main purpose in this world seems to only be to yell at the Emperor Ying Zheng (Li Xuejian) and ask him whether or not he has forgotten his oath to unify all of China. If the Emperor does not answer back it seems as if the whole world will fall apart. This is done several times in the film, and feels completely organic to this world, but not to everyday reality in the slightest. Other court officials and royals must also keep up a constant facade, with seemingly every movement and facial expression meticulously planned out and judged at all times. It's a truly fascinating world built here and feels so unique as you experience it. Where the film starts to work though, is that underneath all of these superficial touches and palace politics lies a story that does seem very familiar; simply about a seemingly earnest man and leader that falls into the pit of believing in his own legend and destiny and loses his humanity in the process. Ying Zheng believes that unifying China will bring peace to the land, but in doing so millions have to die in the process, and the film's director does not shy away from showing so many of those deaths. While an incredibly breathtaking chariot battle opens the picture (and gets across the scale that this movie is trying to present), the film's biggest setpiece comes in the form of the Siege of Zhao, a heartbreaking sequence of raw power. Not only are the region's soldiers depicted dying in battle, but the death of many of its children are shown as well, as they refuse to be captured by Ying Zheng's forces. While the Emperor's march takes the toll on the whole country as well as his own court and loved ones, the film brilliantly pivots to a plot to assasinate him by the woman who loves him most (Gong Li) and a warrior with nothing left to lose (Zhang Fengyi). The Emperor and the Assassin is probably my favorite film produced in mainland China. It's story is so rich with action, intrigue and heartbreak that it's difficult at times to even take it all in, and for a film about a leader losing his ability for feel for actual people, there is so much feeling and emotion from everyone on screen, but it takes place just underneath the surface. I won't say this movie is for everyone, but patient viewers will definitely find a treasuretrove of pomp and emotional brutality. 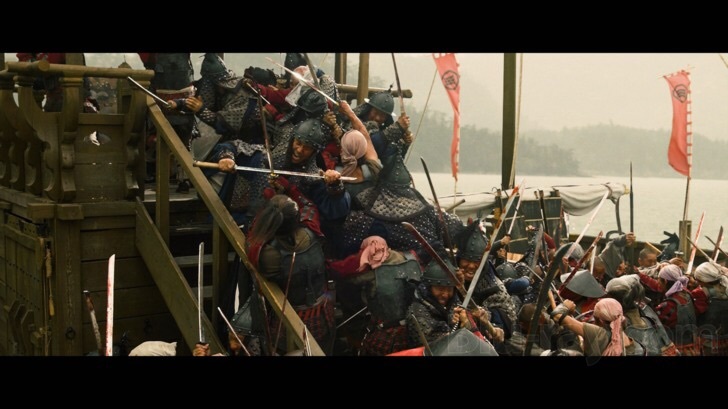 If Musa: The Warrior showed the promise of Korean cinema, The Admiral: Roaring Currents shows that promise in full bloom. One of the major Asian films I've missed during my movie writing sabbatical, this is a giant movie with an emphasis on ancient naval action like I've never seen before. While some of the movie's visual effects don't quite stand up to scrutiny, The Admiral remains a preposterously entertaining movie and displays just how far Korea has come since it really burst on the scene at the turn of the century. To be honest, though star Choi Min-sik is one of my favorite Korean actors, probably the biggest draw to this film for me is that it's about a war I know almost nothing about; the second Japanese invasion of Korea in the late 16th century. Perhaps it's my love of martial arts films or video games, which often show clashes of different ethnicities and fighting styles, but any movie featuring armies of Koreans vs Samurai already has my attention. Thankfully, this is a movie with so much action that it's able to live up to that premise. The final hour of this film is one major battle and it is completely riveting as 12 Korean ships face off against the 330 ships of the Japanese navy. Like Leonidas and the 300 Spartans, the Koreans use strategy and the terrain to help fight the Japanese, but the nuts and bolts of this movie come down to sequences of ships shooting literally everything they have at each other, and then topping off these sequences with awesome close combat fights of Korean sailors and Samurais fighting to the death. To up the ante, the Japanese even employ what appears to be a super-squad of ninja pirates, whom end up being the main antagonists of the picture. I'm guessing it's because Korean history is so filled with wars against Japan, China and Mongolia that you tend get more of these types of ancient matchups in their films then you do from China or Japan itself, and I really hope they keep it up. My geek sensibilities can't help but love a movie like this, as they remind me so much of the types of pictures you used to get from Japan and Hong Kong, such as Zatoichi Meets The One-Armed Swordsman or Duel to the Death, but on a much much larger scale. If you love those types of movies, or are simply into naval battles such as the ones found in Master and Commander or The Pirates of the Carribean films, The Admiral: Roaring Currents gets a hearty recommedation from me. First off, how large a scale do you like your movies to be? Well if you're into GIGANTIC war movies that are five hours long with battles that rival the size of those in The Lord of the Rings films, then I've got good news for you. John Woo's two-part action spectacular Red Cliff is a triumph of visual splendor and collossus-sized combat. Like he was able to do with his Hong Kong classics such as The Killer and Hard Boiled, the director has once again made a film that has shaped the entire industry of Asian cinema, eschewing in an era of imitators not able to match Red Cliff's grandeur just as every Hong Kong film in the 80s and 90s had crazy gunfights and trench coats, but couldn't quite match Woo's films for sheer audacity and cool. Red Cliff makes me recall a portion of Crouching Tiger, Hidden Dragon as Michelle Yeoh's character is reminiscing about her past and speaks about battles of skilled warriors such as herself fighting each other to the death. Those stories always caught my imagination as I pictured scores of fighters flying through the air and engaging awe-inspiring combat. That was also the picture in my mind as I watched this film finally come close to bringing those images to fruition. Based on one of the most famous battles in Chinese history, Red Cliff lands somewhere in between a war film and a superhero movie, with the imperial forces of Cao Cao (Zhang Fengyi) and his insurmountable army of soldiers facing off against the outnumbered but gallant armies of Liu Bei (You Yong) and Sun Quan (Chang Chen). Part I is nearly all setup with our heroes on the run from Cao Cao's soldiers until they decide to unite against the imperials. Along the way Woo fills the screen with stylish brawls and fun mind games between adversaries. One of my favorite bits features the impossibly valiant Zhao Yun (Hu Jun) trying to rescue the family of Liu Bei from overwhelming enemy troops. With a baby tied to his back, reminding me of the most famous sequence from Hard Boiled, the warrior charges straight in the enemy with spear in hand, cutting down all in his path. It's an amazingly athletic and brutal bravura sequence recalling Woo's best slow-motion beauty matched with Shaw Bros ferocity. Even better is the final confrontation of Part 1, which has our now unified, but vastly undermanned heroes trapping Cao Cao's cavalry in a turtle-shaped formation, using their numbers against them. Fending off the villains with shields and spears, the Zhao Yun and his comrades release their generals one at a time to fight the bad guys single-handed. It's a ridiculously fun action scene and a unique enough spin on these types of battles that when the second film climaxes you don't feel like you are just watching the same action sequence over again. Now how strong are these generals you ask? One of them is Guan Yu (Ba Sen), a man so revered as a symbol for brotherhood, military prowess, and heroism that there is a shrine dedicated to him in every police station in Hong Kong, and in the Hubei Province in China they just erected an incredible 1320-ton statue of him. With all that, he's not even the most badass hero in the film. It would be like an American war film with Davy Crockett, Daniel Boone, Paul Bunyan, and George Washington all on one team. Come to think of it, why haven't we made that movie?! At any rate, with Woo taking such a unique approach to his battle at the end of Part I, Red Cliff's climax is free to be a classic battle sequence, and that is exactly how I would describe it. What the director ends up pulling off is one of the most gargantuan, sweeping battles ever committed to film and is a classic in every sense. From explosive naval combat to colossal cavalry, infantry and swordplay sequences, this film has everything an action fan could want, rivaling any onscreen battle I've ever seen. When he returned to Asian cinema, I believe John Woo wanted to make the biggest Chinese film of all time and also make a movie that fit into that classic Hollywood mold of classics such as Gone with the Wind or Spartacus, and I believe on those levels he succeeded with flying blood red colors. Alright, that's it for now, but we'll be back soon with more badass cinema! Do you have any favorite films like this? Hit up our Facebook and Twitter!